They arrested Jesus and took him away. They brought Jesus into the house of the high priest. Peter followed them, but he did not come near Jesus. The soldiers started a fire in the middle of the yard and sat together. Peter sat with them. A servant girl saw Peter sitting there. She could see because of the light from the fire. The girl looked closely at Peter's face. Then she said, "This man was also with him (Jesus)!" But Peter said this was not true. He said, "Lady, I don't know him." A short time later, another person saw Peter and said, "You are also one of those people that follow him (Jesus)." But Peter said, "Man, I am not one of his followers!" About an hour later, another man said, "It is true! This man was with him (Jesus). He is from Galilee!" The man said he was sure about this. But Peter said, "Man, I don't know what you are talking about!" Immediately, while Peter was still speaking, a rooster crowed. Then the Lord (Jesus) turned and looked into Peter's eyes. 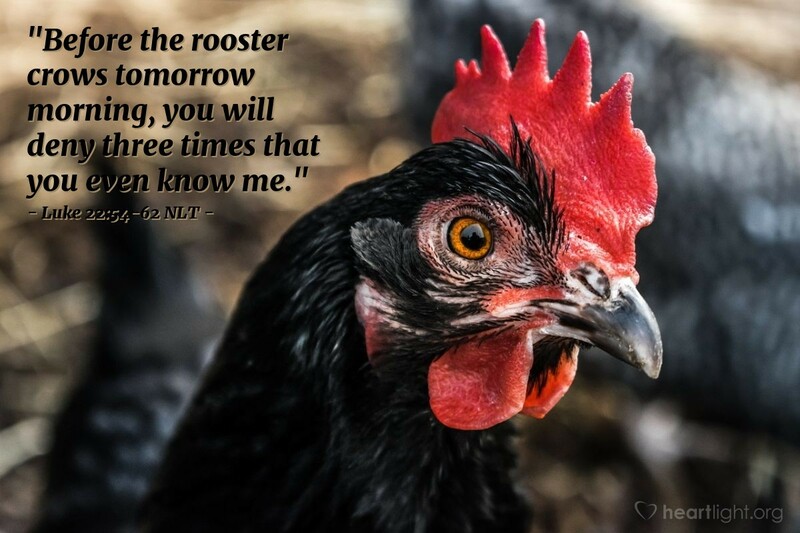 And Peter remembered what the Lord had said: "Before the rooster crows in the morning, you will say three times that you don't know me." Then Peter went outside and cried bitterly. Peter suffered the brokenness of sin and shame. The Lord had warned him, yet he failed anyway. Despite his rash promises, Peter denied the Lord ... three times. The crowing of the rooster roused Peter from his confused stupor and ushered him into the bitter and undeniable reality of his sinful desertion of his friend and Lord. I have had a moment or two like that. Maybe you have, too. It's that moment when you realize that you've dishonored the Lord and let him down, even though you promised yourself, and the Savior, that you wouldn't let him down ... again. Peter is our great reminder that our failures don't determine our future with the Lord. God can take those failures and make something good of them. While our messy failures are not his plan for us, he can take our messes and restore us back into his plan. So please, don't give up when you think you have failed the Lord. Instead, let your sin break you and then come back and openly confess that sin to the Lord and be restored. He will bless you and use you to bless others if you will come back to him. Precious and holy God, my Abba Father, forgive me for my weakness and sin. Forgive me for the arrogance of trying to battle my weakness and Satan's power on my own strength. I trust in your powerful and transforming forgiveness. Help me believe that you can take my failures and my past and use them to encourage and bless others. In Jesus' name. Amen.